On the night of May 28, Mark Parnell (Greens MP for SA), Daniel Spencer, Leonora Herweijer and I (the latter three all being participants in the Walk for Solar Power – Port Augusta to Adelaide, September 2012) slept under the turbines at Waterloo wind farm. Mark had a meeting with some people who objected to the Waterloo wind farm in the afternoon before the sleep-over. I believe he visited one or more of the houses that the wind farm opponents claim have been abandoned due to noise from the turbines. Mark is more generous than I am in that he keeps a very open mind to the claims by the opponents. After having visited the township of Waterloo around ten times, listening for noise from the turbines and hearing nothing, I’m more inclined to think that the opponents are suffering from over-active imaginations. Getting back to the night beneath the turbines, it was quite breezy, with the turbines operating all night and averaging about 60% of their 3MW installed capacity in the early hours of the morning. At this time the sound that I was hearing was very similar to the sound that would be heard from a considerably stronger wind and no turbines, or the sound of heavy surf on a beach. Of course we all had a good night’s sleep. Mark’s tent partly blew down – a windy ridge is not an ideal camp site. I hardly need say that none of us suffered any ill effects from the experience. 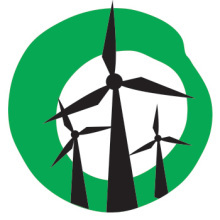 Mark is a member of a Parliamentary Select Committee for Wind Farm Developments in South Australia, together with Ann Bressington, Robert Brokenshire, David Ridgway (Chairman) and Russell Wortley. For the record, this was the sixth time that I had slept in the open near or under the turbines of a wind farm. I have also slept in the old house at Leonards Hill and two nights in the cabin at Toora; both within several hundred metres of wind turbines. Abraham and Bevan did a segment on our night at the Waterloo wind farm on ABC’s Breakfast Reloaded. Mary Morris, a vocal opponent of the Waterloo wind farm, said on the program she lives 17km from the turbines, but when her children get headaches and earaches she blames them on the turbines. South Australian Liberal politician David Ridgway was also interviewed. It seems he thinks the sound produced by wind turbines is somehow going to be very different and more harmful in an abandoned house several kilometres from a wind turbine than right among them. Finally, ‘Bob from Bradey Creek’ was also briefly interviewed. He said he was 10km away, but “I can hear them now”. It happens that the Tothill range of hills, higher than the range that the turbines are on, lies between the wind farm and Bradey Creek. As mentioned above, I have visited the town of Waterloo, three kilometres from the turbines, around ten times now. I have never heard the Waterloo wind turbines from Waterloo township. It is quite impossible that Bob could hear them at ten kilometres on the far side of the Tothill Range. The wind farm debate will go on but the science won’t change… Wind farms are safe. Lol, it should be noted that the author of this article does not live anywhere near wind turbines 24/7, as the people who are affected do. It is also an accepted fact, that only around 20% of people do experience problems living close to turbines. Why should their lives be turned into a living hell, resulting in them having to leave their family homes, because the other 80% say it is ok. Turbines should not be placed near people. After reading that article, this comes to mind. TCW; I live closer to wind turbines than does Mary Morris, who you know well and who claims that her kids get headaches and earaches from turbines. You say that only 20% of people have problems, is this the 20% who have over-active imaginations? As you well know, I have slept beneath wind turbines many times. (ramblingsdc.net/Australia/SleepUnderTurbine.html#Waterloo_again) Have you ever bothered? Why do you not use your real name? Not willing to have people know that it is you who is writing this ill-informed nonsense? Lol, Leeroy, it’s probably not. Which real name would you like Mr. Clarke, there could be more than one, besides, you wouldn’t believe me, you seem to think you know who The Callous Wind is already. If people who are suffering from the turbines are lying about their symptoms, or have overactive imaginations as you state, what do you think they could possibly gain from lying other than losing their homes, their sense of community and all of the equity they have built into their properties?? If you don’t believe the first-person accounts of these residents, what basis do you have for doubting them, other than your personal experience of sleeping in a tent at the BASE of a turbine, which many residents who are suffering, have been doing to ESCAPE the noise. How is it that we known you are not lying about your experience?? How is it that your vested interest in promoting renewables allow you to tell the truth over the residents living 24/7 with wind turbines? RG; I have visited many wind farms many times. I have never managed to hear turbines from a distance greater than 3km (and only once at that distance). Turbines can only be heard at that sort of distance outside and in the absence of other noise such as road traffic. The abandoned houses at Waterloo are all at least 3.5km from the turbines. Many houses are being abandoned in Australian small country towns. It’s happening all the time, whether or not there are wind turbines anywhere near. Homes in tiny towns like Waterloo, with no shops or services, are near unsaleable. Could it be that the owners at Waterloo are hoping that if they can blame the abandonment on the turbines they might be able to get compensation? Lies or delusions? As mentioned above Mary Morris lives 17km from the turbines, yet blames them when her kids get ear-aches. She may well believe it is true. I do not deny that some people believe turbines are making them ill.
My vested interest? It is getting something done about climate change. The ‘identical symptoms’ you write of. I suppose you know that there are more than 200 symptoms that have been blamed on wind turbines? May I ask why you don’t use your real name? Ashamed of something? Next Next post: The wind doesn’t blow all the time. Why doesn’t this make wind power ineffective?